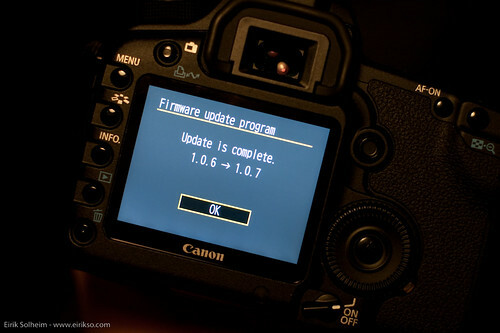 I just updated the firmware on my new 5D Mark II. The firmware is the operating system in my camera. The software that decides how the menus on the screen should look, what the buttons do, and basically everything about how my camera handles the data from the CMOS that sits in there, collecting light when I snap images. I didn’t get any extra functionality, but two issues that I never had problems with are now fixed. Yes, it works fine. But we want more functionality. We want 25p and manual controls for video recording. And in this world of software it is possible for people to make that functionality. For you. For free. Either by hacking the whole camera. Or if you provided an API. Or even better, if you simply published the development tools and software. Your revenue is based on selling excellent cameras and excellent lenses. And I guess Nikon and your other competitors have hacked and examined your firmware in detail already. Open your firmware and you’ll see 25p on the 5D MkII before you can say “development kit”. And you’ll see all kinds of stuff that you and your competitors never thought of. And you know what? People will improve the 5D Mark II firmware anyway. If you help them they will make better solutions. You’ll be a pioneer. Bringing digital photography to the next level. Do it before your competitors! I updated this article with a link to canonhack.com. After a hint from @urke. And because I’ve made the links in this article pretty non-explaining I’ll repeat the link to CHDK as well! A very interesting project that already has enhanced the Canon firmware on a couple of cameras.